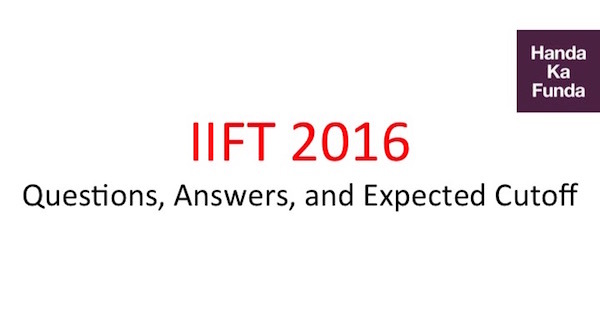 Given below is a complete breakdown of the IIFT Paper. There are couple of reasons we believe that it would be lower than last year. The biggest one of them is the fact that there were wrong questions. We are assuming everyone gets a 0 for the wrong questions. A lot of students wasted time on it which might lead to an overall lower cutoff. One of our students forwarded this paper to us. We used it because it was exceptionally clean. Now we are wondering how the student managed to do that. Anyway, you can download the paper from the below link. It also includes the answer key. * marked questions had an option which was close but not exact. These should be considered incorrect. One set was completely incorrect. If you think some of your friends might be interested in this, please share this post on Whatsapp / Facebook. Sir, hexagon wasnt wrong, one had to make use of options. One could have arrived at t he answer easily. But that is normally not the case. So I have left that part as ambiguous and not marked the answer. Will post something conclusive in a day or two.